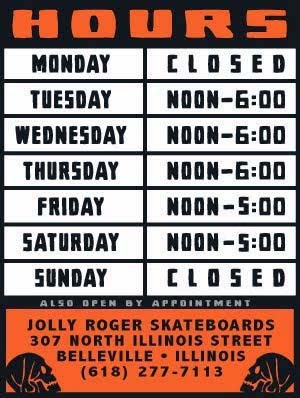 Jolly Roger Skateboards: DROPPING ON WEDNESDAY: Illinois Governors Tees! DROPPING ON WEDNESDAY: Illinois Governors Tees! Our Governors here in Illinois have been making our license plates since 1974. In case you were just born yesterday or you don’t know your Illinois history: OTTO KERNER — Governor from 1961-1968. Resigned to become judge, then was convicted of bribery related to his tenure as governor. Sentenced to three years in prison………….. DAN WALKER — Governor from 1973-1977. Pleaded guilty to bank fraud and other charges in 1987 related to his business activities after leaving office. Spent about a year and a half in federal prison………….. GEORGE RYAN — Governor from 1999 through 2003. After leaving office, was convicted of racketeering for actions as governor and secretary of state. In November 2007, began serving a 6 1/2 year sentence in federal prison………….. ROD BLAGOJEVICH — Governor from 2002 through 2009, when he became the first Illinois governor in history to be impeached. Convicted of numerous corruption charges in 2011, including allegations that he tried to sell or trade President Barack Obama's old Senate seat.